Posted by janina on March 20, 2009 at 4:33 pm. About a month ago, my friend Beth and I were lamenting the Mexican dishes we miss the most living in Philadelphia. You can definitely get good Mexican food here- no doubt! 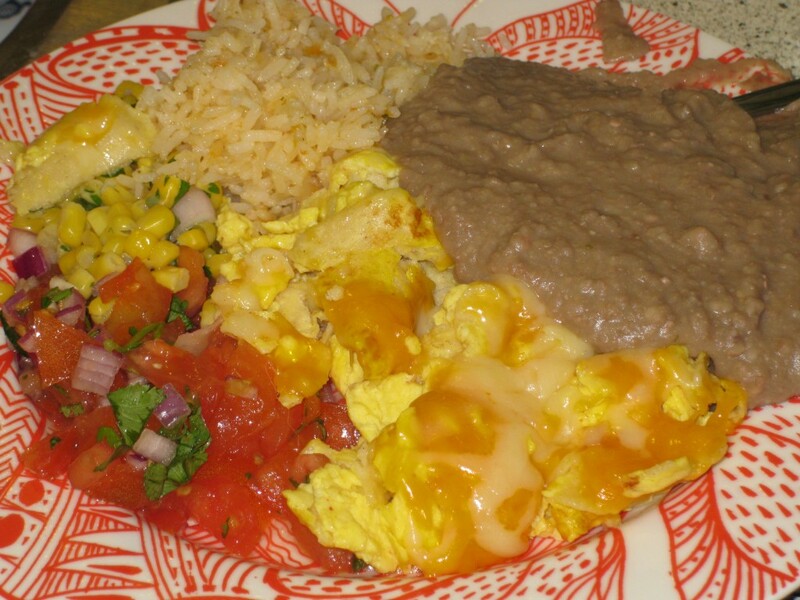 but it is just not the same as a good California burrito, or in Beth’s case, a good Austin plate of Migas. Patrick and I sometimes think the NYtimes is following us, spying on us, and using as idea feeds. It’s uncanny how on par we are with the food, music and booze articles that come out of that magazine. Just a week or so after talking to Beth about migas, and making tenative plans to make it for brunch one Sunday, Laura Anderson wrote an article on the Bitten blog, Missing Migas, about her longing for the Austin classic. Uncanny I tell you. So, eventually this came to frutition, but posting a recipe is nearly impossible since it is basically just a scramble. Instead I’m going to post my recipe for a Smoky Corn Salsa, and give you a little advice for making home made beans. For the migas, ill just post some guidlines. In an appropriately sized bowl, break some eggs and a small amount of milk mixing them well with a dash of salt. Tear some old corn tortillas into strips and mix them into the eggs, then scramble the mixture in a hot well oiled skillet. Top with cheese and cover until melted, serve with rice, beans, and salsa. For extra fatty fun, include avocado and sour cream. Trying to make salsa in winter can be pretty painful. I’m sure you know what I mean, the pink tomatoes that are white on the inside? You can sometimes find some decent cherry tomatoes coming out of Mexico, but you can’t really count on it, and bad tomatoes are really bad. Just thinking about the mealy flavorless sadness makes my mouth dry. Luckily I stumbled upon a decent substitute two summers ago. Corn Salsa. While it’s definitely best fresh (especially if you can find a sweet red corn), out of season corn is no where near as bad as out of season tomatoes. So, when in need, I’ll grab a bag of frozen corn and mix this up. mix ingredients in a medium sized bowl, adding small amounts of salt and lime as you go. serve immediately, or refrigerate until needed. unlike tomato salsa, this corn salsa can be refrigerated without losing flavor. Here are a few simple things I’ve picked up from the ladies I work with. Cook all of your beans with plenty of salt, onion, garlic, a few jalapenos, and cilantro. You don’t have to cut them up, you don’t even have to like them (I am an avid hater of cilantro and jalapenos), but you have to use them. The background flavors they afford the beans are irreplaceable. Don’t use so much water! Soak your beans overnight and then cook them in enough water to just barely cover them. Keep a little water on reserve and add it as needed. This way you won’t lose the flavor of the beans or spices to the broth. Refried beans aren’t actually refried, they are just mashed. The ladies I work with use the bottom of a bottle in a pan to mash them which they say is faster than using a bean masher. I think they are both too slow, so I use a food processor. I’m usually making enough beans that it’s worth pulling it out, and so long as you don’t leave them in too long, you get a great texture with little effort. Use a slotted spoon to pull the beans and spices out of the broth, and add broth as you go to keep the texture consistent. If they end up a little runny, don’t fret, they will thicken up when reheat them. Check the salt content at the end, and add more than you think you need. Beans, like other starchy foods, absorb and hide salt flavors dramatically, so unless you are used to salting large pots of beans or potatoes, you are probably under salting them. The salt will make a HUGE difference. It can take your beans from bland to devine.